It can be very hard for someone who has led an independent life to accept that they might not be able to move like they used to. Often as our body begins to age, it can become difficult to walk. This can be due to things such as arthritis, osteoarthritis, injury, and disease. Whatever the cause, the inability to walk does not have to mean the inability to freely move and many have discovered the wonderful service that a mobility scooter can provide. Taking trips to the shopping center, mall, or even amusement parks can be done easily and freely on a mobility scooter. Mobility scooters are personal mobility devices that utilize an electric motor to easily and efficiently transport a single individual. Many people also invest in scooter bags or baskets and are able to do their grocery shopping easily and without any assistance. 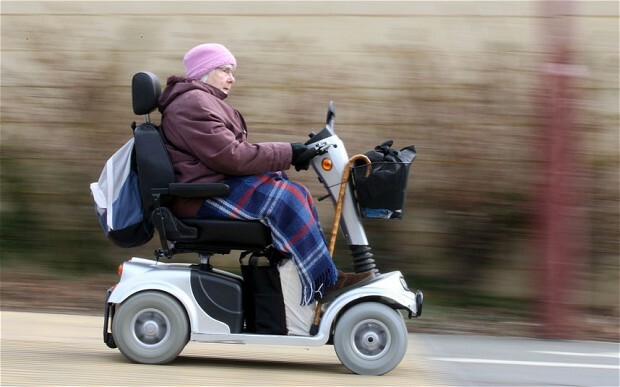 One of the major advantages to a mobility scooter is that it is very easy and simple to operate. Most use a set of handle bars that is attached to an adjustable post called a tiller. The tiller can be positioned nearer or farther from the seated individual to accommodate individuals of differing sizes. The accelerator can typically be easily controlled by a single finger or the thumb and most have an automatic breaking system, so you need only use one lever and do not need to worry about a brake pedal or lever. The range that a mobility scooter can travel varies depending on the model. Some units can travel significantly over 30 miles per charge and at speeds of over 10 mile per hour, but most travel around 5 miles per hour and over distances of 10 – 20 miles per charge. The weight capacity of these units also varies by model, but some can support in excess of 500 pounds. Many people find that by purchasing an extra battery and ensuring that it always stays charged; they can effectively and inexpensively double the range of their mobility device. For people who have difficulty walking or moving, a mobility scooter provides a very easy to use and reliable means of transportation. This in turn ensures that they retain their independence and also their freedom.